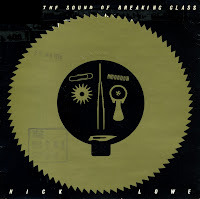 Nick Lowe reached number 7 in the UK singles chart with 'I love the sound of breaking glass'. It was his first solo hit single, after having been a member of bands like Brinsley Schwarz and Rockpile. His debut solo single was 1976's 'So it goes', followed by three further singles that didn't chart. 'I love the sound of breaking glass' (1978) was a radio hit even in the Eighties, which is how I got to hear it. The B-side, an old track by Lowe with his band Rockpile, has a pretty funny lyric by the way.